How do I setup Wifi for my smartphone, gaming console or just to get rid off the cable in my laptop? In front you have to know that the connection in the rooms is an Ethernet connection and not like in most households DSL. 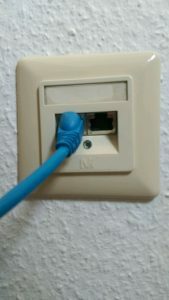 The second option is that you connect your PC to one of the Lan-ports(in picture yellow) of your router. Now you open the web interface of your router in your browser(Internet explorer, safari, chrome, …). The needed address and login information should be also printed on a label on the bottom of your device. The address should be similar to 192.168.x.1. With the open web interface you do the Setup-Wizard. You chose as connection type “receive IP automatically over DHCP”. Another common name ist “IP-Client-Modus”. Remember the connection is an Ethernet connection and does not need any Login data . If you have trouble with one of the steps you can come to our consultation hour and we configurate your router together.